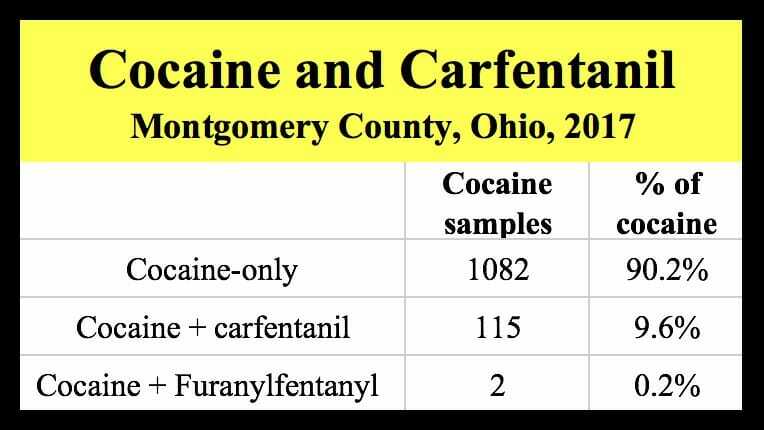 The ultra-powerful opiate carfentanil was found in nearly ten percent of cocaine seized by law enforcement in Montgomery County in 2017. This dangerous cocaine-carfentanil mixture likely played a major role in a spike in overdose deaths last year that attracted international media attention to Dayton. 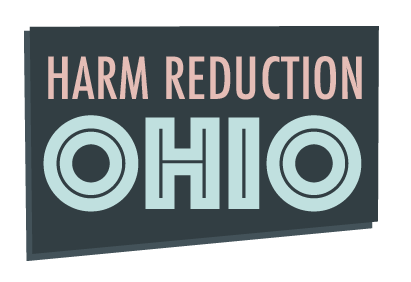 Harm Reduction Ohio reported earlier that, in the Cleveland area, about 10% of cocaine had fentanyl or an analog in it when lab-tested. Carfentanil accounted for 40% of the fentanyl varieties found. In Montgomery County, the result was even more ominous. Carfentanil was found in 115 of 117 cases of adulterated cocaine tested at the Miami Valley Regional Crime Lab. Carfentanil, legally used as a large animal tranquilizer, is estimated to be 100 times more powerful than fentanyl when measured in pain relieving ability. The degree to which it causes reduced breathing — which triggers overdose death — is not well studied but appears to be many multiples greater than fentanyl, making it extraordinarily dangerous if not diluted properly and precisely. Montgomery County, which includes Dayton, has a population of 535,000 and has had a drug overdose mortality rate among the country’s highest. 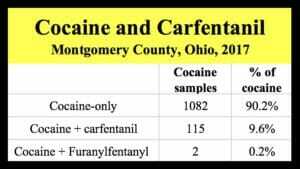 Last year, in 139 overdose deaths, cocaine and an unspecified fentanyl was found in the victims’ system at autopsy, reports the Ohio Department of Health. 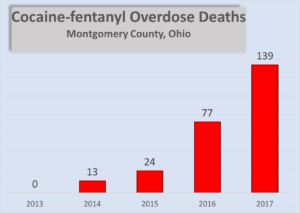 The following chart shows how cocaine-fentanyl has driven overdose death in the county — and an analysis of law enforcement drug seizures shows that carfentanil is likely the analog causing so much death. 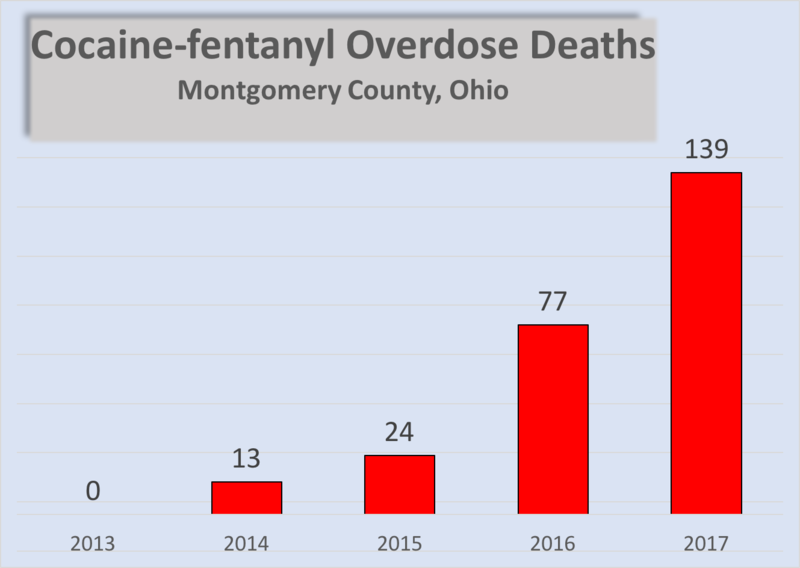 By comparison, the county recorded only two heroin-fentanyl deaths in 2017. However, this number will understate the number of opiate users who died, because much of what was sold as heroin, cocaine or meth contained none of those drugs but only fentanyl, carfentanil or an analog. Airline pilot Brian Halye died of a cocaine-carfentanil overdose in March 2017. 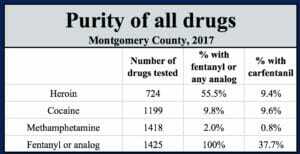 Of the nearly 5,000 drug samples seized by law enforcement in Montgomery County and tested at the Miami Valley Regional Crime lab, 29% contained only fentanyl or a variant. Less than 10% of what was seized in 2017 was just heroin, down from 60% in 2013. Cocaine with no other controlled substance accounted for 22% of the county’s seizures, down from a peak of 45% in 2011. 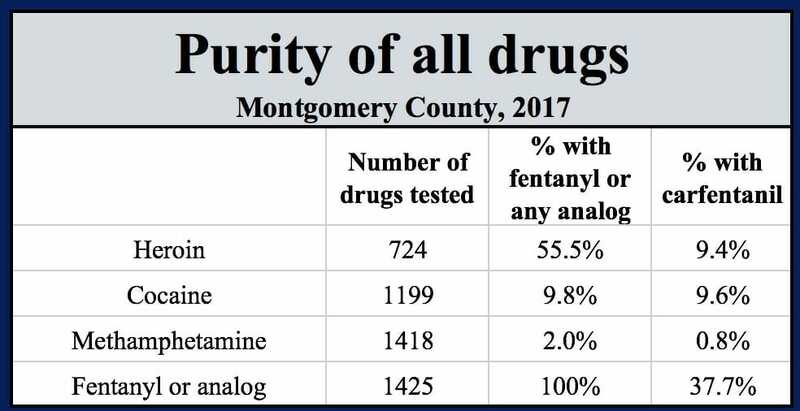 Overall, fentanyl and its analogs were found alone or in a mixture of 40% of what was sold as heroin, cocaine and meth. 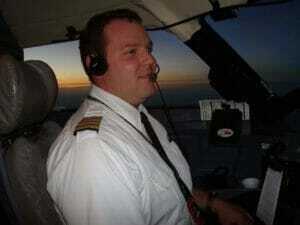 Ohio has to start focusing on what’s in the illegal drug supply and its relationship to overdoses and deaths. Impurities in the illegal drug supplies are causing the most death, not the heroin or meth or cocaine that people seek to use. Right now, our bias is “it’s all illegal, so what do the details matter?” But when it comes to living or dying, what the adulterant is and how much of it is in an illegal drug mixture makes all the difference. We need to make detailed drug seizure data transparent and a part of everyday drug policy. Lab test results should be published weekly — monthly, at a minimum — in every county so users and health authorities can understand risk and reduce the overdose death toll in this epidemic.